Oakville, Ontario – May 23, 2012 – Promys Inc., a leader in PSA software for the IT solutions provider industry, is excited to introduce the new Cisco Audit Compliance Scorecard. Promys software provides visibility into many Cisco audit criteria areas which can help IT systems integrator businesses pass their Cisco audit more easily. 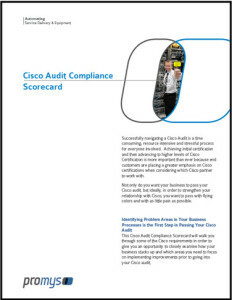 Interested businesses can download this practical tool by visiting our Cisco Audit Compliance Scorecard download page. “IT Solution provider businesses have had great success with our existing Mid-Project Profitability Scorecard that identifies gaps in mid-project profitability and our Labor Utilization Scorecard which offers an additional layer of insight and labor metrics to make informed decisions,” Breakey continues. For more information about Promys, please visit promys.com or call 1-866-728-2345 or email us at info@promys.com. For updates on the release of future scorecards, be sure to sign up for our email mailing list by entering your email at the bottom right hand corner of the Promys website.